‘If we don't sit here where have we to go?’ / ‘Well, there's our walk every day. And we are allowed out twice if it is fine, and our boating in summer, and our little visits to the church and to the convents.’ / ‘And you're twenty-one and I'm nineteen and a half,’ Kitty said hysterically. ‘My God, what a life!' Gerald O'Donovan's novel Vocations (1921) is set in a small town in late Victorian Ireland, and is a searing indictment of priests competing to acquire girls and their dowries for the church, and exploiting their high social status. Winnie and Kitty Curtin, the two daughters of the wealthy grocer, are being firmly driven towards the Sisters of Mercy by their determined mother. Kitty’s furious resistance to becoming a nun is thwarted by a most unattractive suitor, and Winnie’s glad embrace of the veil is driven by her secret passion for Father Burke. 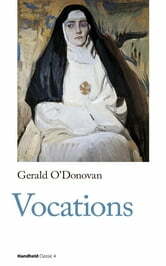 O’Donovan was ordained in 1895, and was a friend of Lady Gregory, W B Yeats and George Moore, and a supporter of Gaelic League. He left the priesthood in 1908 to work in London’s East End, and married in 1910. He had a secret twenty-year affair with the novelist Rose Macaulay: Vocations was written at the height of this relationship. Chrissie Van Mierlo’s introduction explores the literary, cultural and religious background to the novel, and more widely in O’Donovan’s writing.